Shrek tickets are now available! If you would like to reserve your tickets to SHREK, they are now available via this link. There is no limit on amount of tickets you can reserve but we do ask that you spread out the amount of guests that attend each night. So maybe Grandma, Grandpa, six Aunts, and 3 cousins don’t all come on the same night but rather Grandparents one night and Aunts and cousins another. Catch my drift? This way everyone gets to see the masterpiece we have been creating! We can’t wait to see you all and show you what we have been working on! Here at conservatory we have a bulletin board that houses an envelope labeled, “Shout Outs”. What is a shout out? A shout out is recognizing someone for doing something great that deserves special mention. Teachers, students, observers, can write one (or several) on a card and submit them in that envelope. Every week we have been picking a “highlighted” shout out to both present on the board itself and here! We never posted the one from last week here, so this week we have 2! We also have some extra shout outs this week that deserve a mention. A few of our teaching artists/directors were honored last night at the NY Innovative Theatre Awards Nomination Event. Jessica Bashline’s production of THE DROWNING GIRLS that starred Marissa Porto as well as a production of A MIDSUMMER NIGHT’S DREAM starring Elise Reynard were both nominated for Best Revival of a Play. Unfortunately this means their shows are competing…but it is nice to see so much love from the NYIT awards for our Wingspan staff! 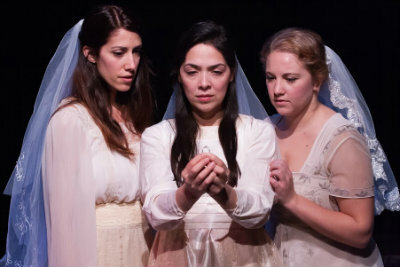 Marissa Porto in Strange Sun Theater’s production of THE DROWNING GIRLS directed by Jessica Bashline. Come see Musical Mania’s performances this week! …the good kind. Not the broke-my-bones kind. 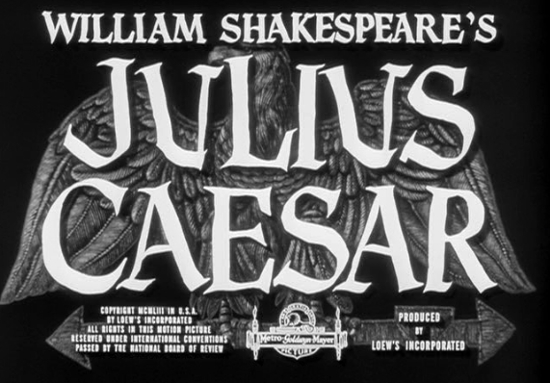 Just a reminder post that tomorrow is JULIUS CAESAR. High school students, if you are signed up to go please review the information below. If you are not in the high school program but want to check out this show, please do! It is free! The students will be released at the normal 5:00 time and will be responsible for getting themselves to and from the theatre. We will all meet at the theatre at 6:40pm. The show is in Carroll Park, which is on President Street between Smith & Court Streets in Brooklyn. 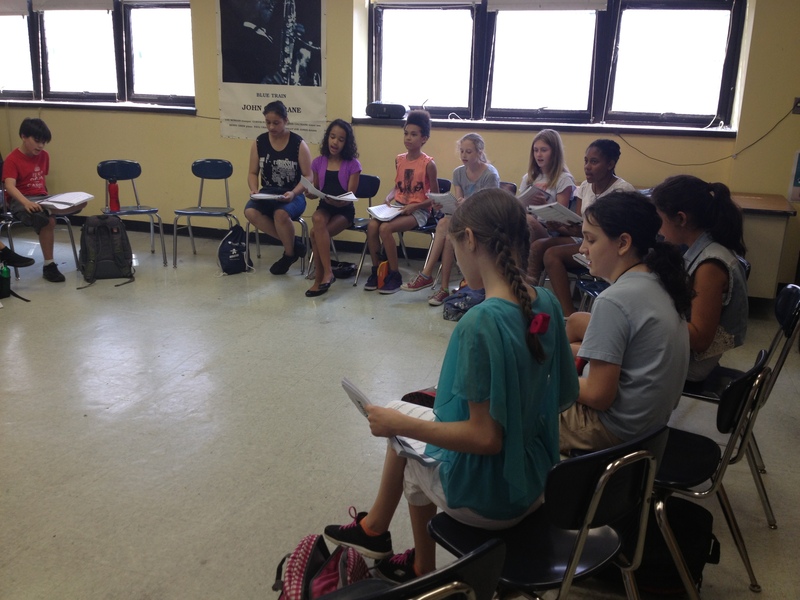 Middle school students reviewing audition music in their singing class. They are all very excited and nervous! Whew. I can’t believe today is already over (almost). It seems like it was 8:30am about 5 minutes ago. I guess time does fly when you are having fun. Our first day was a smashing success! 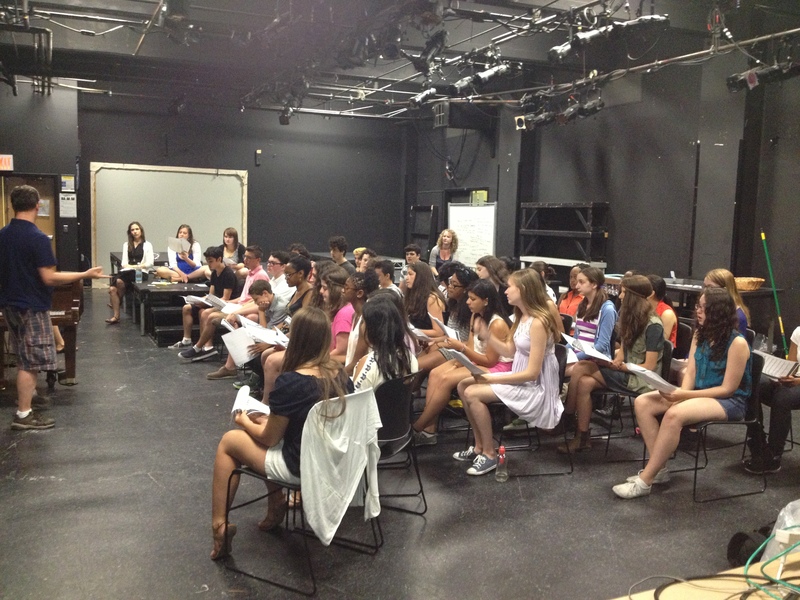 We cannot express how excited we are to be working with these unbelievably talented students. They are truly inspiring! Below are some photos of our first day here! There will be lots more to come so keep checking back! 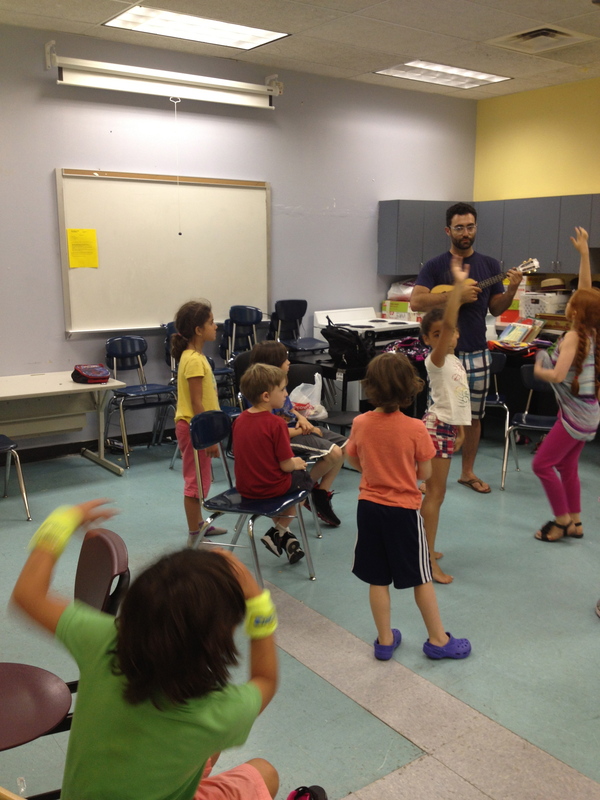 Some of our youngest students working with teaching artist, Jono Waldman, in Musical Mania. They were learning about the ukulele. Very exciting! 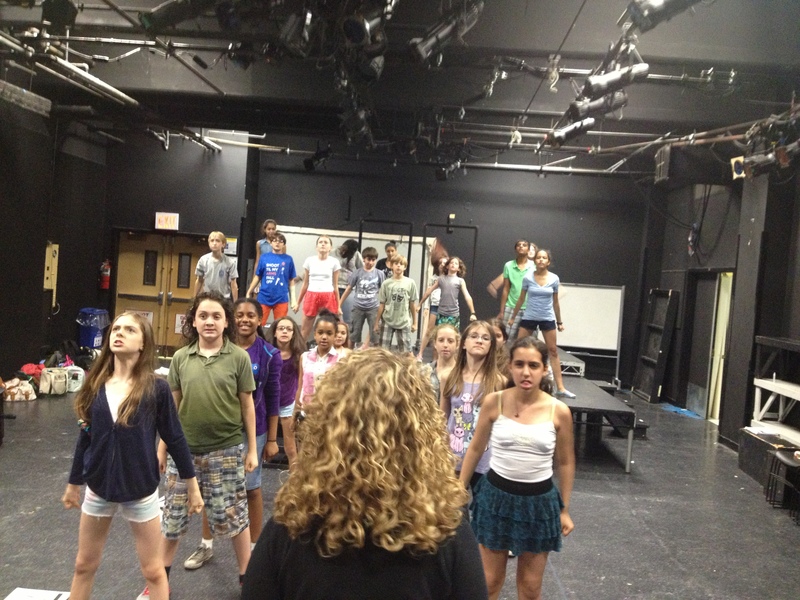 Middle school students in class with teaching artist, Valerie Hager. Getting to know each other with string! We can’t believe that it’s already HERE! See you all tomorrow! Remember, no one can be in the building before 8:55am. When you walk in to the building, you will see 2 sign-in tables. Players & Ensemble sign in on the left, Musical Mania sign in on the right. Once you sign in, you will wait in the cafeteria until it is time to start! We also asked our Musical Mania team some questions so you could get to know them a little better. Here is how they answered! I was born and raised in Sacramento, California. I have been involved in theatre since I can remember. My parents noticed I had a flare for the dramatics from an early age and made sure I had opportunities to explore that myself! I took ballet and tap as a little girl and was also involved in Camp Music Circus in Sacramento. I did some theatre throughout my younger years but did not get serious about it until High School. In fact I did not know I could sing until my Junior year in high school!! My high school theatre experience was very influential and a major reason why I decided to continue my theatrical education in college at The Hartt School in Hartford, CT. There I completed 4 years of intense study and received my BFA in Musical Theatre in 2007. After taking a few years to audition and grow as an artist I decided to go back to school and I received my MS in Theatre Education this past May 2013. I know that theatre and performing will always be a major part of my life and I look forward to where it takes me next! What is your favorite play or musical? Blythe Spirit, A Midsummer NIght’s Dream, Spoon River Anthology, The Importance of Being Earnest, Tartuffe. Who is your professional idol or role model? What are a couple of highlights of your professional career? I was a part of a great new play, The Phoenix Flower, where I played the lead role of a young girl struggling with her body image and identity. One of the hardest and most vulnerable roles of my life. I’m from Ardsley, New York. My first role was the Bunny Who Wanted Red Wings in first grade. I’ve been hooked ever since. The Bunny Who Wanted Red Wings was a pretty great part, actually; chock full of both comedy and tragedy. I suppose I peaked early. It’s impossible to pick just one, but the last great show I saw was Old Hats. Probably my dad. He’s an illustrator and a painter who’s managed to get paid doing what he loves for almost his whole adult life. Impressive stuff. In a five-person, off-broadway production of Macbeth, I got to play both Ross and Old Siward (Old Siward was a hand puppet, as were all the English characters). In Act 5, scene 8, Ross delivers the news the news to Siward that his child has been killed in battle. Getting to play both sides of that exchange simultaneously was a great challenge both as an actor and as a puppeteer, and I loved doing it. I sing and play the blues, along with a lot of old timey jazz, with my band, the 5000 Jazz Assassins. Also, I’ve never met a jar I couldn’t open. We also have our Assistant, DANA EISMAN! She did not get a chance to answer my questions but luckily I can tell you a little about her because I have known her since she was in about 6th grade! Dana perfectly represents the community of the Wingspan Conservatory because she attended our programs from the time she was about 12 years old until she aged out and graduated from high school! And now she is back working for us–full circle! Dana is an amazing performer with one of the most spectacular singing voices I have ever heard. She is now off to The Hartt School of Music in the fall to study musical theatre! We are all VERY excited to get started next week!! I started performing professionally in 1993. Founding my company, Avant Dance Project, for kids with unlimited talent but limited financial means. I have been dancing since I was four years old and was in my first musical (The Sound of Music) in the second grade. I would love to play Kate in Kiss Me Kate and I would love to play any part in HAIR. I don’t really have any one role model. I admire people who work hard at what they love to do, whatever that may be! This past year I created and taught a theater class for 2 and 3 year olds, my youngest students yet. I was so inspired by their imagination and playfulness and loved teaching them. Another highlight was producing the play PRINCE in 2012. It put all my skills to the test and was one of my most challenging and rewarding experiences yet. I can juggle and recite the alphabet backwards. I’m also a great cook! 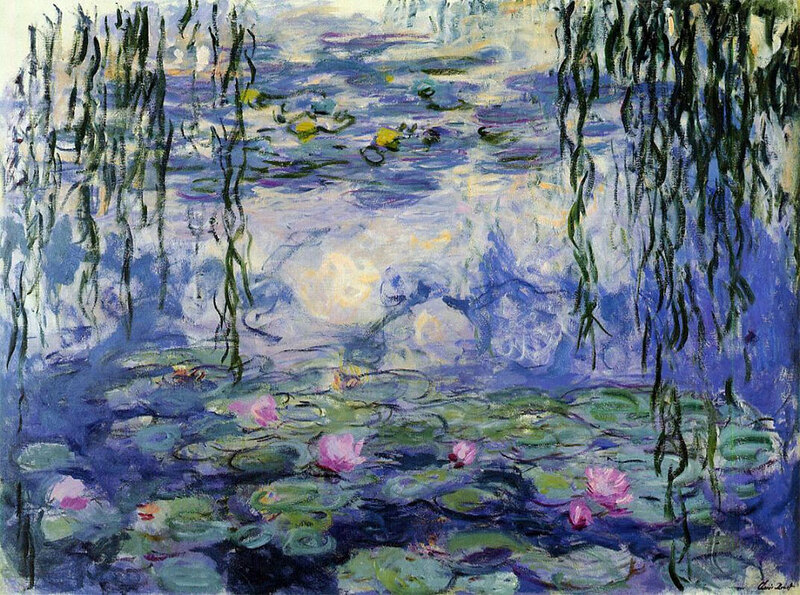 I did my first show when I was in the 3rd grade, I sang a song about a plastic alligator, I still know the words and the dance moves (you can feel free to test me). I have many dream roles- but the one I know I can NEVER play is Effie White- so, I’ll go with that. My favorite musical changes often, but recently it has been Merrily we Roll Along. Who is your professional role model or idol? My professional idol these days is Diane Paulis, I thought Pippin was genius! I have spent the last seven years working with the Wingspan Arts Conservatory- and every year has been special and amazing. This will be my last summer as the head of this program, as I am moving on to pursue some other artistic aspirations. So I can already say that this summer will be a highlight in this incredible career I have had here. Well they wouldn’t be secret if I told– BUT i can recite the entire first verse of “Modern Major General” on one breath..
I’m originally from Greensboro, NC, but I now happily reside in the diverse community of Astoria, NY. I’ve had a passion for theatre for what feels like all of my life, but my first experience was in 2nd grade when we performed classroom skits. I was a mosquito. Needless to say, I have been hooked ever since! I have a dream of one day playing Margaret Johnson in “The Light in the Piazza.” I’m aware that I’ll need to be about 15 years older, but I am willing to wait. I have to say that “Les Miserables” is my favorite musical, because it was the first full-scale musical theatre production that I ever saw. I listened to the soundtrack so many times that I memorized the entire show and often sang it to my favorite stuffed animals. My incredible mother will forever be my role model for her kindness and strength. After working professionally as an actor in new york productions and in national tours, my interest shifted to doing theatre with young people. I’ve had a very exciting couple of years working with private, public, and charter schools as well as community centers in NY and NJ to provide theatre-based instruction. I couldn’t be happier with my career and am excited to see what happens in the future! I can do a very strong monkey imitation. Depends on the day and mood I’m in. One of my mentors, William P. Ward, who spent his career creating in Flint, Michigan. The town may have been depressed, but his art and dedication to his students lit up the cultural center for over 30 years. 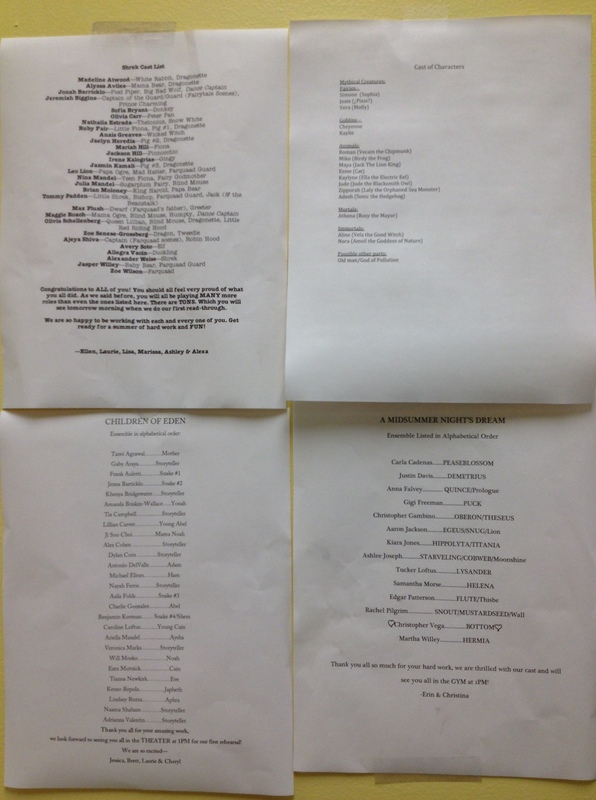 My Manhattan Association of Cabaret Award nominations. Working with No Strings USA to create educational and peace building films for children in the developing world. Well, one could argue that I got bitten by the bug the day I stole a solo in my preschool graduation. Not really STOLE, but rightfully took back what was mine… I had a solo and some other girl decided she wanted one too, so the teacher turned it into a duet. During the performance I just stood directly in front of her and sang my heart out…my parents were really embarrassed. Our Town always gets me. Every time I start thinking I don’t like it as much, I read it again and remember how great it is. My favorite musical changes a lot depending on where I am in my life, but old standbys that I will always listen to are: Into the Woods, RENT, Les Mis, Ragtime, The Last Five Years. I have so many, but here are a few…Cate Blanchett, Katie Finneran, Sutton Foster, Amy Morton, Ann Bogart, and my amazing professor and mentor from college, Alma. I actually had a really amazing year professionally, so I can say that 2013 was a highlight! I recently graduated from grad school and was certified to teach theater. That took me a few years so I am really proud and excited that I finished. I also was in a show called The Drowning Girls that Bashline directed at The Walker Space. It was my return to the stage after a few year hiatus and it was so incredibly rewarding and reminded me how much I love it. It was also really cool to see my name and good reviews in some big NY papers!! I was born in Windsor, England and grew up in Boston, MA. GO SOX!! From the age of three, I put on shows in my parents basement. Some of my best work, really. Working with John Barton (the founding artistic director of the RSC) on sonnets in Oxford. WOW!!! He was amazing. Like if Yoda were a Shakespearean genius! Playing Puck in Midsummer Night’s Dream with New York City as the backdrop! 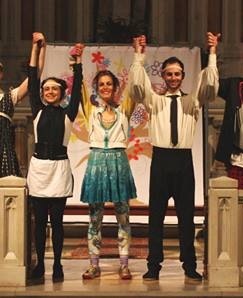 Playing Beatrice, Adriana, Aemilia, Juliet, and so many other wonderful characters from my favorite (Shakespeare) plays! I can walk solely on my big toe! I’ve been dancing since I was four years old. The Method Gun is a performance/play/dance created by the Rude Mechs, a multidisciplinary group out of Austin, TX. It is an awesome example of collaboration across disciplines! I don’t have one – I have many! Meredith Monk for her ability to work in many disciplines, Pina Bausch for the safe space she created for her dancers, choreographers and dancers my age who create spaces and shows for new work! What are a couple of highlights of your professional (or non-professional if you are an intern and haven’t had one of those yet) career? I was a 2012 RAW Materials Artist at Dance New Amsterdam where I was mentored by Yanira Castro and presented a new work, LadyMargaretRhodaChrystalLaurenGail, as a part of a group show with other RAW Materials Artists. In August I will begin the MFA Dance program at University of Illinois! I consider myself a nail artiste. My friends often ask me for funky manicures with designs inspired by Keith Haring or Piet Mondrian!